Gamebook Adventures 3: Slaves of Rema is the third in the series of Gamebook Adventures. Like the previous instalments, it features dice-roll combat, with a quick-roll feature if you don’t want to wait for animations. You can also check your character sheet throughout the game to see how your stats are going. There are bookmarks to save games, and an interactive world map. Slaves of Rema also has three difficulty levels: Classic, Bookworm and Novice. There’s a new Shield value for better defence in battles. 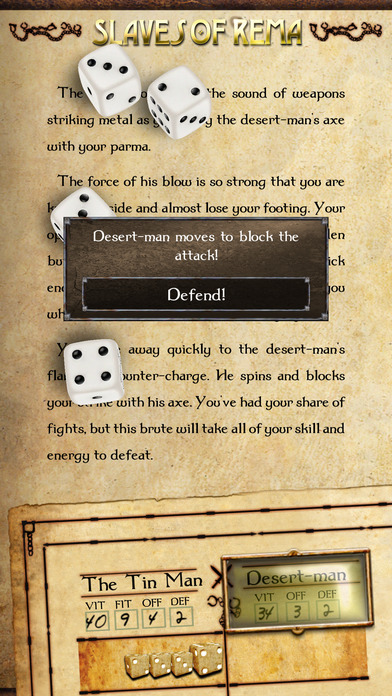 The gamebook interface has also been updated, with widgets to access inventory, settings and the main menu. There are more achievements to collect than in either previous game, and there’s a specially-composed soundtrack.